The Purpose of Life is to Attain the Great Awakening-Enlightenment-Know thyself. Shetaut Neter enjoins the Shedy (spiritual investigation) as the highest endeavor of life. Shetaut Neter enjoins that it is the responsibility of every human being to promote order and truth. Shetaut Neter enjoins the performance of Selfless Service to family, community and humanity. Shetaut Neter enjoins the Protection of nature. Shetaut Neter enjoins the Protection of the weak and oppressed. Shetaut Neter enjoins the Caring for hungry. Shetaut Neter enjoins the Caring for homeless. Shetaut Neter enjoins the equality for all people. Shetaut Neter enjoins the equality between men and women. Shetaut Neter enjoins the justice for all. Shetaut Neter enjoins the sharing of resources. Shetaut Neter enjoins the protection and proper raising of children. Shetaut Neter enjoins the movement towards balance and peace. As a Neterian, I follow the Ancient African-Kamitan religious path of Shetaut Neter, which teaches about the mysteries of the Supreme Being, Neberdjer, the All Encompassing Divinity. I believe that from Neberdjer proceed all the Neteru (gods and goddesses), and all the worlds, and the entire universe. Since Neberdjer manifests as the Neteru, Neberdjer can be worshipped as a god or a goddess. I believe that there is only one Supreme Being, Neberdjer, and that the gods and goddesses are expressions of the One Supreme Being, Neberdjer. As a Neterian, I strive to come into harmony with the gods and goddesses, the Neteru, by developing within my personality the different virtuous and divine qualities they symbolize; this will lead me closer to Neberdjer. As a Neterian, I also believe that Supreme Being I call Neberdjer is the same Supreme Being that is worshiped by other religions under different names. I believe that Neberdjer established all creation on Maat, righteousness, truth, and order, and that my actions, termed Ari, determine the quality of life I lead and experience. If I act with Maat (positive Ari) my path will be free of suffering and pain. When I forget Maat and act in an unrighteous manner (negative Ari), I invite suffering and pain into my life. As a Neterian I believe when my body dies, my heart’s actions will be examined against Maat. If it is found that I upheld Maat during my lifetime, I will have positive Ari, and my Akhu (spirit) will become one with Neberdjer for all eternity. This is called Nehast, the Spiritual Awakening-Enlightenment. If it is found that I acted with selfishness and greed, I will have negative Ari, and my Ba (soul) will suffer after death and then be reincarnated again to live in the world of time and space again. This is called Uhemankh (reincarnation). As a Neterian I believe in the teaching of Shemsu, following the path of Shetaut Neter, by practicing the disciplines of Shedy, which include: Study of Wisdom teachings (Rech-Ab), Devotion to God (Uashu), Acting with Righteousness (Maat) and Meditation (Uaa). 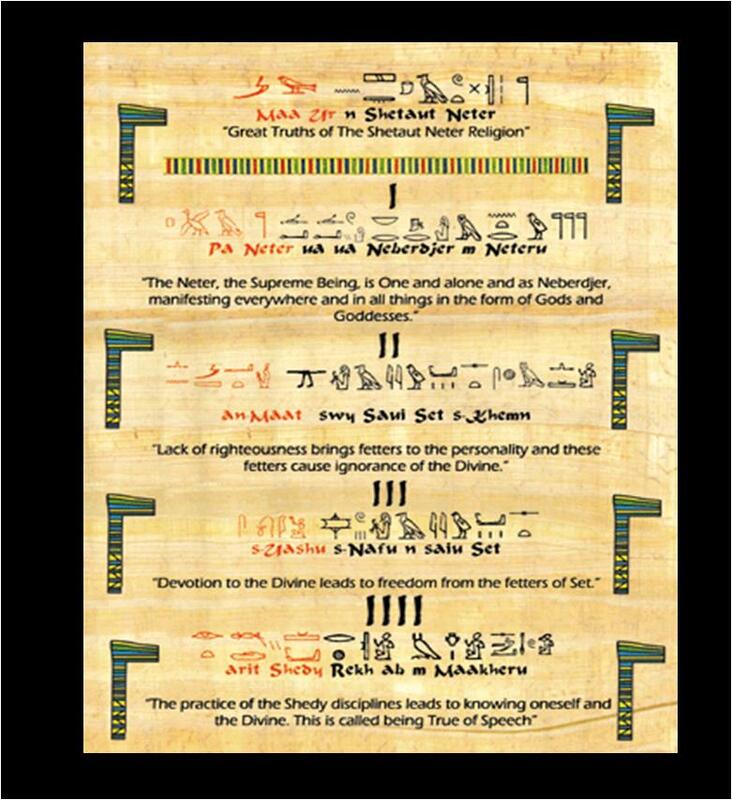 Neberdjer provided the Shetitu, the spiritual teaching that was written in Medu Neter (hieroglyphic scripture) so that the Shemsu (followers) might study the wisdom teaching of Shetaut Neter. Two most important Neterian scriptures are the Pert M Hru and the Hessu Amun, and the most important Neterian myth is the Asarian Resurrection. By the practice of the disciplines of Shedy, I will discover the Shetaut (Mysteries) of life and become Maakheru, Pure of Heart. I will become one with God even before death, and I will discover supreme peace, abiding happiness and fulfillment of my life‘s purpose, and promote peace and harmony for the world. Before starting the study of the Neterian myths it is important to have a wholistic concept of Neterian philosophy. That is, an aspirant should begin to gain an understanding of the integral aspects of Shetaut Neter religion even as the myths and disciplines are studied and as the teachings are practiced. In this manner, the serious aspirant may begin to absorb the wisdom of the teachings by receiving varied elements in small doses so as to comprehend them well as develop a keen intellect and a purified personality. The scroll is an elegant and colorful reproduction of the four essential teachings of Shetaut Neter, designed for placement at the personal altar and daily reading or for being framed and displayed for daily reading.